Sun, Apr 7, 2019, 11:09 pm SL Time, ColomboPage News Desk, Sri Lanka. 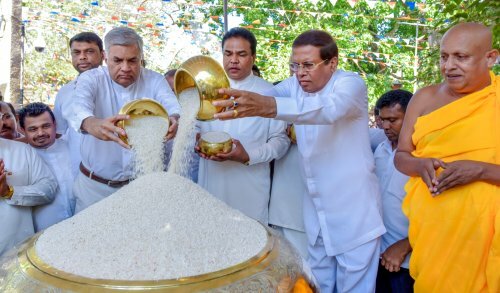 Apr 07, Colombo: The national "Aluth Sahal Mangalyaya" (New Rice Festival), the annual ritual of dedicating the year's harvest to the Sri Maha Bodhi in Anuradhapura was held today under the patronage of President Maithripala Sirisena and Prime Minister Ranil Wickremesinghe. The National Ceremony of the New Rice Festival organized by the Ministry of Agriculture and Department of Agrarian Services Development was held for the 52nd time this year. 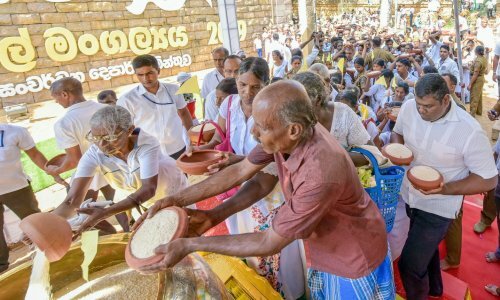 Following the religious rituals at the Jaya Sri Maha Bodhi, the President offered the first portion of the toxin-free rice threshed from the first harvest of paddy in the Maha Season to the Jaya Sri Maha Bodhi. The farmers in the Rajarata then offered the first portion of their harvest of the Maha Season wishing for rains on time for the success of their cultivations. The traditional offering of Bees Honey during the festival took place under the patronage of leader of the Indigenous people Uruwarige Wanni Yala Eththo. The event was organized under the auspices of Chief Incumbent of Atamasthanaya Venerable Pallegama Siri Nivasa Nayaka Thero. Speaking at the occasion, Prime Minister Ranil Wickremesinghe said that this is part of Sinhala civilization. He said that the life depended on a successful harvest. Paddy was grown using water collected in small tanks built in villages. It was ritual to offer the first portion of a successful harvest to Gods. After the arrival of Arahat Mahinda Thera that custom was practiced near the Ruwanweli Seya. He noted that many of these areas could not be cultivated due to the drought. "However this time we have received a bountiful harvest of more than 3 million metric tons of paddy," the Premier said. "This is the highest harvest during a season received by the country and we should both thank the Gods and the farmers for that." However the Prime Minister cautioned that the farmers should be able to face the climate change that is taking place. The Premier pointed out that modern methods should be used and ways should be explored to increase income by selling the produce. He said that the government has paid its attention on modernizing paddy cultivation and also to retain young generation with farming. 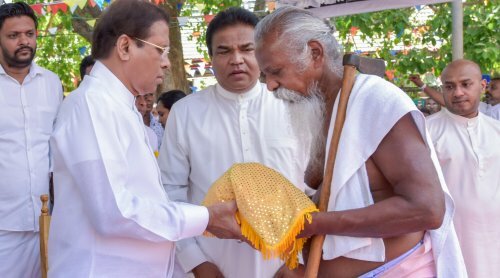 Chief Monk of Ruwanweli Chaithyarmaya Venerable Pallegama Hemarathana Thera, the Maha Sangha, North Central Province Governor Sarath Ekanayake and a large group of people were present at the ceremony.